We have several paperback copies available for checkout. 2000: the class of '69 gets together for a 30-year reunion. (Yes, that doesn't add up.) Rekindled passions! Lost youth! NPR interview with the author. Most libraries over a certain size try to arrange their books in some predictable fashion. In the United States the two most common types of arrangement are the Library of Congress classification scheme and Dewey Decimal classification. Most academic libraries use the Library of Congress arrangement as it is best if you have a big library or lots of books on the same subjects. Most public libraries use the Dewey Decimal system. It works very well if you have a smaller collection with a lot of variety - and it is also easier for both library users and librarians to understand. Melvil Dewey took all sorts of classification ideas in the air at the time, the 1870s, and came up with his structure. Based on the idea that the areas of knowledge can be categorized, Dewey settled on 10 major areas, each in turn divided into 10 subsections (the Dewey 100) and each of these divided into 10 sub-sub-sections (the Dewey 1,000). 000 to 999 = 1,000 numbers. Then you have a decimal point which can be followed a lot of other numbers which will give you additional information. All very elegant, all very Baconian. Full of secret codes. What are the letters? Just the first letters of the authors surname. If you have several books with the same Dewey number you sort them out alphabetically by author's name. Libraries differ in how they note this. If a book has a Dewey number does this mean it is non-fiction? No, no, no. Fiction fits into the scheme. The 800s are literature. Shakepeare's plays are in 822.33. Most libraries just pull a lot of the fiction off the Dewey shelves so you won't find half the library full of row after row of 800s. But be very, very careful. Don't make assumptions as to where a fiction book will be placed. J-R 025.4 FINDLAY Digging into Dewey by Diane Findlay. 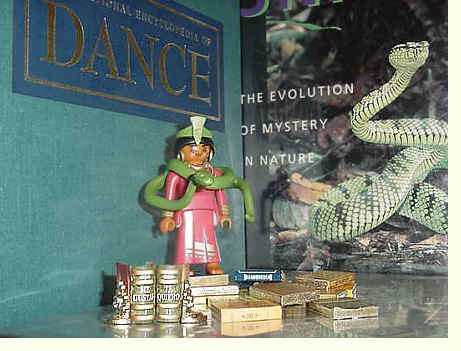 And where would you put a book on snake dancing? If the main focus is on the dance, in dancing. If on the snakes, with snakes. Now get up and dance. The SF collection is shelved separately from other fiction and so you should check the catalog before roaming about to search for a book that could be in the SF section. Time-travelling with Connie Willis? Go to SF. With Jack Finney? Try general fiction. Why? Decisions made long ago for reasons lost in mist. The call number prefix in the catalog will tell you where a book is located. So what is in SF? A mix. Science Fiction: technology, robots, space travel, aliens, future civilizations, etc. Landscapes may be desolate or highly metallic. Interesting architecture. Fantasy: magic, dragons, unicorns, elves, wizards. Landscapes may be thickly forested and dripping damp. Any metal is apt to be filigreed. Huts and stony tors. Other Stuff: for example alternate history, fairly straight history with time travel, etc. Gore Vidal's The Smithsonian Institution might be placed here (but isn't). 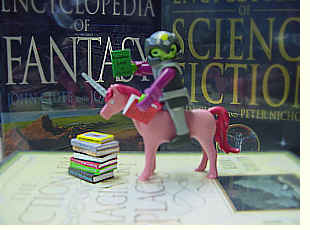 Many famous authors write both "hard" science fiction and fantasy, or mix elements of both within a single work. And remember - a book that seems to be science fiction or fantasy may be in general fiction instead. To make things even more confusing, genre cross-over books are increasingly common. You could have a highly romantic mystery set in 2083. Where do you put it? Want to see short reviews of a lot of recent SF books? Go to Booklist Online. We have a paid subscription which you are welcome to use. In the J room we have no separate SF collection. Look for the little blue Science Fiction stickers on the spines of books.